After a thousand-plus kilometre invasion and destruction of U.S. ecosystems, Asian carp are now poised to enter Canada’s Great Lakes—where they could unleash incalculable and irreversible damage. Inside the desperate fight to stop the swarm. Four fish lay motionless on the metal slab in the laboratory, lying good side up. Their wide, recessed eyes are blank and unseeing. Traces of blood pool underneath each recently dissected Asian carp, though surprisingly there is only a faint smell of fish in the air. Beside the tray of fish are two industrial-sized boxes of purple rubber gloves. “They’re essential when you work with dead fish,” says Becky Cudmore. The 39-year-old scientist is the manager of the Centre of Expertise for Aquatic Risk Assessment (CEARA) at the Department of Fisheries and Oceans’ Canada (DFO) at the Centre for Inland Waters in Burlington, Ontario. She has spent the past eight years studying Asian carp, an aquatic invasive species that has the potential to wipe out most native fish species in the Great Lakes. These particular carp are donated evidence from a January 2011 Ministry of Natural Resources (MNR) seizure at the Windsor/Detroit border. Seeing them under the bright fluorescents of the lab, it’s easy to wonder what all the fuss is about. Thanks to their seemingly unstoppable spread, Asian carp are on their way to becoming the latest household name in aquatic threats—joining such past invasive species as zebra mussels, sea lamprey, and alewives. Already, their presence in midwestern waterways has proven a history of ecological destruction on a tremendous scale. Over the past 40 years, the carp have spread hundreds of miles north from the American south, outcompeting native fish species, destroying ecosystems and spawning with alarming fecundity. They’re now poised to invade the Great Lakes. There they would unleash incalculable damage on freshwater ecosystems already plagued by a litany of environmental problems—unless Canadian and U.S. governments can figure out a way to stop them. Asian carp is an umbrella term, the collective expression for several carp species (bighead, silver, black and grass) that belong to the Cyprinidae family. Of them all, bighead and silver pose the largest threat, and therefore receive the most attention. What makes these carp so devastating, ironically, is exactly what attracted early aqua-culturalists: bighead and silver are filter feeders with gluttonous appetites, capable of thriving in a broad range of habitats. This makes them ideal pond cleaners. It also makes them ideal invaders. Bighead and silver outcompete native species through sheer volume. Researchers cannot begin to estimate how many Asian carp now exist in America, but have determined carp have cultivated the entirety of the Mississippi River and much of the Illinois and Missouri rivers and their hundreds of tributaries. More than that, they are huge: Over a 20-year lifespan, carp can grow to 100 pounds. Both feats are achieved largely through destruction. Some carp filter feed plankton by straining water through their gills and eating whatever they catch, allowing them to consume upwards of 20 per cent of their body weight in a single day. They are also opportunistic feeders, devouring whatever is available at multiples levels of the aquatic food web. The hazards of their filter feeding on native species are two-fold. Asian carp out-feed secondary consumers that rely on phytoplankton and zooplankton as their primary food source and also reduce available food supplies for tertiary consumers across the food web. Both bighead and silver are highly tolerant species, capable of building sustainable populations in diverse habitats. Rapid spawning during multiple annual peaks means Asian carp also typically outbreed their native competition. This destruction of natural ecosystems can rarely be fixed—no matter how hard humans try to mitigate the damage. Ultimately, the intricacies of healthy, working ecosystems are “little understood and too sophisticated for [humans] to reproduce even with the most advanced technology,” reports the Australian-based Ecosystem Services Project, which studies the services humans obtain from their environments and their economic and social worth. All of this would only become apparent after bigheads were introduced into the U.S. in 1972 from China, followed by the introduction of silver carp in 1973 from eastern Siberia. Both species were placed in aquaculture facilities in the southern United States to help keep retention ponds and wastewater facilities clean Each made it into the wild through severe flooding, release as baitfish, or a combination of both. Once there, they broadened their range significantly. By 2007, Asian carp had slipped the sewage lagoons in Arkansas and spread to 23 surrounding states, moving north to Minnesota and South Dakota through the Mississippi, Missouri and Illinois rivers and their tributaries—conquering dozens of new habitats and destroying even more native fisheries along the way. Between 1995 and 2003, the United States Fish and Wildlife Service caught five bighead carp in Lake Erie, triggering fears the fish had already reached the Great Lakes. When subsequent monitoring efforts in Ohio failed to locate further samples, researchers concluded no sustainable population of the species existed in the Great Lakes. But they were getting closer. In 2002, Asian carp were detected in the upper Illinois River about 95 kilometres from Lake Michigan—by 2010, a bighead carp was caught in Lake Calumet in Chicago, just under 10 kilometres from the Great Lakes, a vast new habitat to cultivate. The current threat to the Great Lakes, however, might never have been—save for Chicago’s sewage conundrum 115 years ago. In the late 19th century Chicago was growing quickly and solutions for sewage treatment were ineffective. The favoured method of dumping sewage into the Chicago River meant residents suffered from typhoid and other diseases at alarming rates. An alternative was needed. In reversing the flow of the Chicago River by connecting it with the Illinois River, Chicago diverted their sewage from Lake Michigan to the Mississippi. Construction of the 28-mile Chicago Sanitary and Ship Canal began in January 1900, making stable urban growth for Chicago possible. Eder is referring to the proposal to permanently separate the Great Lakes and Mississippi watersheds—a move that is massive in scope and extremely controversial. While permanent, partial, and semi-permanent options each significantly reduce the likelihood of Asian carp migrating into the Great Lakes, they come with a price tag in the millions, have their own flaws—and can be a tough sell in the face of less expensive Band-Aid solutions. As a result, the various plans to physically separate these watersheds—complete, single-barrier, four-barrier, and five-barrier, all meticulously outlined in the GLC and GLSLCI report Restoring the Natural Divide—is caught up in a time-consuming permitting, funding, design and approval processes. Ideally, at least one of the four options will be chosen and shovels will be in the ground by 2017 or 2018. That is, if it moves forward at all. The abundance of competing regional interest groups and lobbies foreshadows a protracted debate and years of study before any comprehensive plan to physically separate these adjacent watersheds is possible. Neither Chicago nor the state of Illinois has officially supported the erection of physical barriers in the Chicago Area Waterways System (CAWS) system. Predictably, the majority of opposition is coming from container shippers on the Mississippi and the industries that rely on them. Many opponents of the plan believe physical separation would close the CAWS for good. They are mistaken, says GLSLCI executive director David Ullrich. His organization’s reports show it would add five percent in time and 10 percent in cost to materials shipped by barge. Compared with huge financial and ecological damages wrought by an Asian carp invasion, though, a 10 percent increase in barge shipping isn’t much. Hansen testified that coordinated control efforts to halt sea lamprey—another Great Lakes invasive species—had been extremely successful since the 1950s because U.S. and Canadian governments committed the necessary resources to tackle a problem of such magnitude. As of 2010, Hansen noted, “no such effort exists for other invasive species, including Asian carp.” In the two years since this dismal statement, progress has been incremental. DFO announced in October 2010 that the federal government would allocate $415,000 over 18 months, in addition to Ottawa’s one-time allocation of $4 million in support of DFO’s national invasive species program. With it comes an in-kind contribution from the GLFC to fund research into the economic, social and financial tolls of Asian carp’s presence in the Great Lakes. Meanwhile, other organizations are already warning about its potential to cause damage past Chicago’s waterways. The U.S. Court of Appeals for the Seventh Circuit reported in August 2011 that, “We need not wait to see [Asian carp] being pulled from the mouth of the Chicago River every day before concluding that the threat of a nuisance exists. It is enough that the threat is substantial and that it may be increasing with each day that passes. Consider the carp’s current presence in the Mississippi River. While it is difficult to determine the exact percentage of Asian carp biomass (the amount of living matter in a given habitat), in some areas the figure is reportedly pegged at 90-95 percent. Think about that: 90-95 percent of all organic material in some areas of the Mississippi River is now Asian carp. As of 2007, Commercial fishers on the Illinois River routinely catch upwards of 25,000 pounds of bighead and silver carp daily. Over 9.1 million pounds of Asian carp is caught annually from the Illinois River alone, but such huge catch numbers do little to deplete the population. Incredibly, a new facet of the commercial fishing industry has been born in the Midwest by catching and freezing Asian carp for human consumption in China. Since 2009, fishers have been plying the waters of the Illinois River and have sold hundreds of thousands of pounds worth of silver and bighead carp to the country they came from, a potentially problematic act that promotes the propagation of a species governments are attempting to eradicate. Indeed, it’s worth examining the financial risks associated with the spread of Asian carp into the Great Lakes. Currently, the total cost to Canadian governments for dealing with 18 minor invasive species is pegged at $34 billion annually—not one-time costs, but annual financial burdens. Asian carp could increase that number greatly. Much else must be considered: lump sum and annual costs spent on prevention and damage control once a species is established; revenue lost to commercial, recreational, and tribal fisheries due to native species destruction; jobs and wages dependent upon healthy ecosystems; and damages to the immeasurable services offered by a healthy ecosystem that is no longer functional. Plus, if Asian carp break through the barriers in Chicago and enter Lake Michigan, they could become the most expensive invasive species to manage in North American history. Yet the cost of controlling an invasive species is only the tip—there is also the mountain of associated costs and lost revenue. Take the Great Lakes fishery: the GLC estimates that $16 billion is spent annually on boating trips and equipment, with some of this money trickling down to Aboriginal groups specializing in fishing expeditions on tribal lands. Commercial and sport fisheries generate an additional $7 billion in economic activity annually as part of 1.5 million jobs the Great Lakes directly sustain, generating an estimated $62 billion in annual wages. 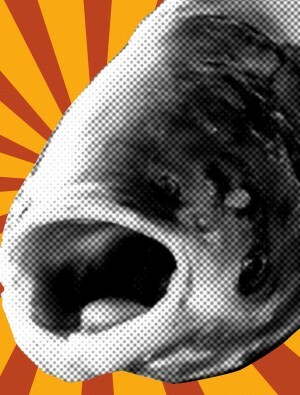 If Asian carp enter the waterways, the recreational fishing industry could likely not survive such a monumental blow. When asked how well North American governments have done preventing the spread of invasive species into the Great Lakes, Ullrich sighs and admits, “We have had very limited success managing or controlling any individual species.” Of the 182 non-native species in the Great Lakes, the overwhelming majority exist without any effective checks and balances. (Alien invasive species implies some level of harm is caused by the species presence, whereas non-native species are not necessarily destructive.) Canada has, quite simply, failed to prevent or control the presence of invasive species in our shared waterways. In more than 70 years only two species have been controlled, and with limited success: alewives (a species of herring that thrived in lakes Michigan and Huron due to lack of predators between the 1950s and 1980s) and sea lampreys (a primitive, eel-like fish that, once attached to a host fish, simply drains their bodily fluids until the host dies). Sea lampreys utilized the Welland Canal in southern Ontario—built to bypass nearby Niagara Falls—as their vector point into the Great Lakes around the turn of the 20th century. Signs of their damage to native fisheries became apparent in the 1930s, but it was not until the 1940s that dramatic declines in native fish species were conclusively pinned on the eel-like invader. By the late 1940s, the harvested catch of lake trout, a keystone species in the Great Lakes, fell by 99 percent from a decade earlier—a total collapse. In 1955, the American and Canadian governments had no efficient way to monitor damages, let alone research effective control measures. The bi-national GLFC was established largely in response to this invasion. The specific nature of lamprey’s life cycle allowed researchers to target breeding grounds, a control measure that has had significant success in reducing population numbers. It comes at a cost of $20 million annually. The GLFC estimates they have spent roughly $300 million since 1956 on sea lamprey control. But while the population of sea lampreys has been reduced to 10 percent of its 1940s peak, it has not been eradicated—control means an acceptable level of minimized, though ongoing, damage. If $20 million annual expenditure defines success in the struggle against invasive species, failure must be staggeringly expensive. Zebra mussels serve as an example of our inability to prevent or control invasive species; their impact, true to form, has been devastating. Originally brought to North America in the ballast water of Russian freighters, zebra mussels (Dreissena polymorpha) were released into Lake St. Clair between Lakes Huron and Erie in 1988. Less than a decade later, zebra mussels had spread to all five Great Lakes and into the Mississippi, Tennessee, Hudson, and Ohio River basins, attaching themselves to anything solid—from slow moving marine life such as turtles and crayfish, to boats, boat trailers, harbours and water intake pipes. Once established, zebra mussels can even grow on top of other zebra mussels, forming layers over 12-inches thick. According to the USFWS, the zebra mussel infestation in the Great Lakes and adjacent waters cost the American and Canadian governments $5 billion between 2000-2010, a figure not expected to decline unless food supplies diminish and the colonies collapse independent of human involvement. Annually, the mussels cost Canada and the United States $300-$500 million, all for “managing” a single invasive species. Dr. Hansen lamented in his U.S. House Committee testimony that “sea lampreys changed the human way of life in the Great Lakes basin.” He needn’t be so species-specific: The ecosystem stresses and changes that began with sea lampreys in the 1950s have continued through the decades with dozens of injurious invasive species—Asian carp are merely the latest, and perhaps most dangerous—though the public conscience and the government policy makers are only beginning to fully appreciate the extent of the danger. Seventy years on we have controlled the lamprey, but what would we give to have prevented their occurrence in the first place? Have we learned our lessons well enough to find a better definition of success with Asian carp? As Cudmore says, “I don’t think anyone in the world has been successful at controlling invasive species.” Back in her office, the fiberglass bighead gaping, open-mouthed behind her, she offers one final warning: “Don’t wait until they get here.